Are you a creator and/or a lover of new plays? We’ve rounded up some links you may find useful. First, to find out about new plays being performed locally, sign up for the New England New Play Alliance e-newsletter. This is a weekly newsletter featuring the current and upcoming performances and readings of new plays by New England playwrights. It’s just one of the ambitious initiatives of the New England New Play Alliance, a task force of the performing arts service organization Stage Source. Next, read ArtSake’s partial overview of organizations producing and supporting new plays in Massachusetts, from companies mission-committed to new plays, to local festivals, to new play development programs. Then, if you’re interested in topics and issues surrounding the creation of new plays, check out HowlRound, an organization with national reach that is based out of ArtsEmerson in Boston. HowlRound features a number of communication streams that explore and support new plays, as well as intriguing online tools like HowlRound TV and the New Play Map. Interested in considering new ways that new plays can be produced? Explore the work of Boston Public Works, a collective of Boston-area playwrights who banded together to produce one work by each of the members, “putting the power of production in the hands of the playwright.” The group raised funds with an IndieGoGo campaign and produced plays from 2014-2017 (see the photo, above, from a read-through of Cassie M. Seinuk’s From the Deep). Finally, the National New Play Network has just launched a new online “discovery and recommendation engine” called the New Play Exchange. It allows new play creators to create profile pages and share as much of their work as they’d like – offering a potentially new model for connecting new plays to interested theatres and collaborators. Read about the New Play Exchange on HowlRound and check it out. Please feel free to share more useful links in the comments. For more useful resources, check out ArtSake’s Working Artist’s Toolkit. 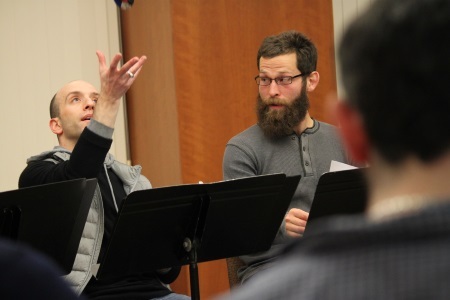 Image: actors Charles Linshaw and Jeff Marcus in a read-through for FROM THE DEEP by Cassie M. Seinuk, to be produced by Boston Public Works March 12-28, 2015. Photo by Marc J. Franklin.